That line from Joni Mitchell’s song “Woodstock” has been singing in my mind ever since I began thinking about books on gardens for the spring issue. The sound that haunts me, however, isn’t from the composer’s version, but the one sung by Ian Matthews and backed by Gordon Huntley’s eloquent pedal steel guitar on the album Later That Same Year by Matthews’ Southern Comfort. Huntley weaves a spell of such beauty, no place but an earthly paradise could live up to it. Of real world here-and-now gardens in my experience, I think of Hidcote near Chipping Campden in Gloucestershire, which I visited with my wife and 10-year-old son at the time of his all-consuming fascination with plants and flowers, particularly exotic deadly ones (a year later it was electric guitars and exotic, deadly music). As it happens, Hidcote was the creation of an American expatriate named Lawrence Johnston, who settled in England in 1900 and began laying out the garden ten years later. During the same UK summer, we visited Vita Sackville-West’s Sissinghurst Castle Garden, which shared the Arts and Crafts style of Hidcote, with its sequence of outdoor “rooms.” I was always the semi-reluctant hanger-on, for these visits took place when my wife was reading her way through the letters and journals of Sackville-West’s soulmate Virginia Woolf and my son was doing the same with field guides and botanical esoterica. The Gardener’s Garden (Phaidon $79.95), conceived and edited by editors at Phaidon Press with 1200 illustrations and an introduction by Madison Cox has been called “the ultimate garden book,” featuring over 250 permanent gardens by leading garden designers, horticulturalists and landscape architects, from the 14th century to the present day, and covering key types and styles of garden. The featured gardens have been selected by an international panel of experts, including, along with Cox, Ravindra Bhan (India), Toby Musgrave (UK/ Denmark), Bill Noble (USA), Dan Pearson (UK) and Made Wijaya (Bali). Summary texts explaining each garden and its design and planting features are written by leading garden and horticultural experts, including Edwinna von Baeyer, Ruth Chivers, Noel Kingsbury, Jill Raggett, Christine Reid and Lindsey Taylor. Featured gardens include Cox’s Ain Kassimou garden in Morocco, the High Line urban greenspace in New York, Japan’s serene moss garden ‘Saiho-ji’, and the Renaissance garden Villandry in France. 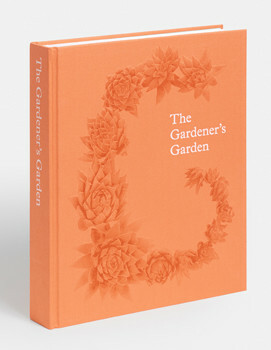 In the visual tour of The Gardener’s Garden narrated by Madison Cox on the Phaidon site, he suggests that the garden has always “represented paradise,” a notion that sent me to the lush description of Eden in Book IV of Milton’s Paradise Lost—that “delicious Paradise” seen through Satan’s eyes; the blossoms and fruits “at once of golden hue” with “gay enamelled colours mixed,” groves “whose rich trees wept odorous gums and balm,” between them “lawns, or level downs,” “Flowers of all hue, and without thorn the rose:/Another side, umbrageous grots and caves/Of cool recess, o’er which the mantling vine/Lays forth her purple grape, and gently creeps.” Note that this being Eden before the fall, the rose has no thorns. Being wholly benighted on the subject (let Gertrude Stein say it, “a rose is a rose is a rose”), I went looking to see if there are thornless roses, and found a list, but with an asterisk admitting that “some thornless varieties may have a rare thorn or two, or small thorns under the leaf.” So there you have it, if you want a truly Miltonic before-the-fall no-thorns rose, turn to Paradise Lost, Book IV, line 256.